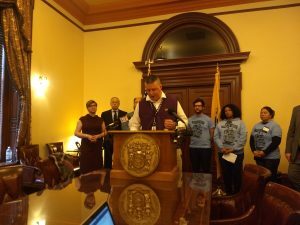 Senate Bill 3170, which garnered a 3-2 vote along party lines at the Senate Commerce Committee on Thursday afternoon, came on the heels of 2018’s Toys R Us bankruptcy and closure which left thousands of New Jersey residents without employment. The legislation calls for expanding the Worker Adjustment and Retraining Notification (WARN) Act, a decade-old law on the books in New Jersey aimed at giving employees time to prepare for layoffs from their place of work. Sen. Nellie Pou, D-35th District, at a Feb. 7 press conference in Trenton. “The case of the Toys R Us bankruptcy, while not doing anything technically illegal, they did something that I believe to be reprehensible,” S3170 sponsor Sen. Nellie Pou, D-35th District, said Thursday morning in a Trenton press conference. “They gave little warning and almost no severance pay to the vast majority of their store employees, leaving them out in the cold with no paychecks and no lead time to prepare, while executives took massive million dollar bonus checks home, a golden parachute,” Pou said. S3170 would require severance pay of one week for every year worked and lengthen the required layoff notice from 60 to 90 days, if the business employed more than 100 people and the move would leave at least 50 people without a job. The bill also tacks on an additional four weeks of severance pay if the company violates the notice provision. Employers will have to give a 15-day notice ahead of bankruptcy filings, and prohibit termination six months up to the bankruptcy and two years after. Pou and Senator Joe Cryan, D-20th District, another sponsor, brought out a handful of Toys R Us workers to the Thursday committee hearing to detail their stories of decades of employment at the toy retail giant only to receive at most four weeks of severance following last year’s bankruptcy. A former Toys R Us employee details his short-notice lay off in 2018 in Trenton on Feb. 7. Yet the measure drew out the criticisms of several business advocacy groups. “The mandatory severance provisions under the bill would add to a series of recently enacted tax increases and other expensive mandates imposed on employers during the past year and make New Jersey’s business climate even less competitive,” testified Mike Wallace, vice president of government affairs at the New Jersey Business and Industry Association. “What will end up happening if expanded to 90 days is that the businesses may be pulling the trigger far in advance while they are still working… with the banks, with financing,” testified Christina Renna, senior vice president at the Chamber of Commerce Southern New Jersey. 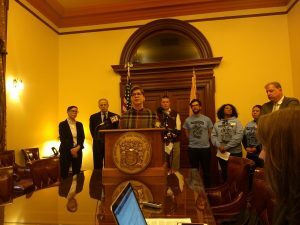 And food retailers such as grocery stores could be hit hard by the legislation if they need to make a strategic closure or move of any of their locations, said Mary Ellen Peppard, vice president of the New Jersey Food Council.